This exceeded my expectations. It’s fast and loaded will all kinds of great features. Highlights, notes, bookmarks, font/size, audio, etc. I REALLY like how the reader operates like a web browser so if you jump all over the place using references, you can easily navigate back to where you started. This seemed pricy, but glad I got it, it’s worth it in my opinion. Super intuitive, fast Bible app. I love having the Bible at my fingertips. I enjoy the daily devotions as well and I like that I can highlight my favorite verses and refer to them later. It is so easy to use. It has everything I need to study God’s true word. I love this app! Really enjoying using this app. Much easier to use than others I have. I love that you can also purchase other translations for use in the same format. Love the everyday English of the NLT Bible and that from what I have seen so far it keeps close to the original meanings of the texts. This is a great app works well never had it crash or anything of the sort! Easy to read, works fast. Love the way you can highlight verses. Contains multiple versions of the Bible for purchase and fantastic devotionals. I also have hard back copy that was bought for me in 1996. I love this app. The verses are easy to see. I wish they would update the choosing of the books and chapters after taping the wheel. It looks dated. Use this app all the time, it is very easy to use. Thanking GOD for this app!! LOVE, LOVE, LOVE this app! Translations (I have 4 and purchased them on sale days), ability to take notes, highlighting with different colors (helps me keep track of what I've read/studied), copy and paste feature, search tool...are only some of the perks of this app. Info transfers to new phones and updates have enhanced the features of the app. I'm SO grateful for the programmers of this app; God has indeed blessed them with their talents to bring God's Word to the ends of the earth! It's a must have app for everyone!!! Highly recommend this bible app. I love the offline feature, I can read the Bible anywhere regardless if I'm connected to any network. Very easy to use; love having it with at anytime; like the highlite feature. Still helpful after several years! I have been using this app for several years now even through a change of devices. It is very helpful! Having several translations and two study Bibles has made preparing for Bible studies a much fuller experience. When I have had a tech problem the folks at Tecarta have been a quick email away with solutions and answers. This has been an easy app for me to use as I am not computer savvy! I recommend this app! Love the newest updates - it was good before but now has so many new options that I can personalize. Keep up the good work Tecarta! Awesome, easy to read, offline reading. It's a very easy to use app that you can read anywhere. I haven't used many other features yet but it has devotional and a few other cool things. Relevant and easy to read! My wife and I just love this app. Thanks for making this version available in a app. This version is my favorite, because it is so easy to understand! A significant improvement. Thank you. Wonderful app! Able to read and take notes very easily. I have totally enjoyed the app. Thank you very much. It is easy to use and contains a lot of wonderful information. I love this bible. The fact you can compare translations is very helpful. I suggest translations in different languages like French, Italian etc...My native language is French and I would very happy to read the verses in both languages. I love having this app available with a couple strokes of my fingertips. Reading God's Word help me to have peace of mind. Thank you! I use this application for my Sunday School Lesson. And it has really helped me to organize my thoughts and I explain God's truths clearly. This app will give you offline access to NLT. 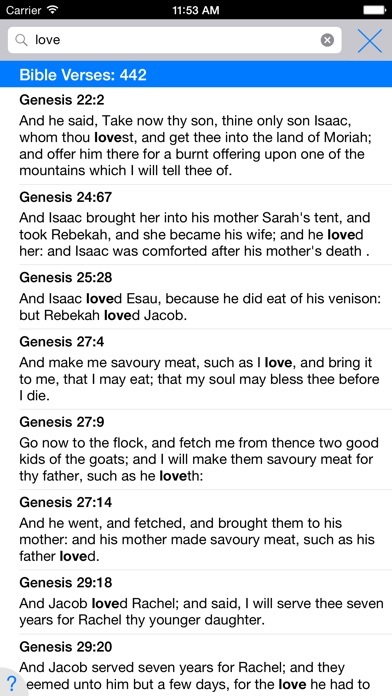 I like the translation because it's easy to read and the app because you can quickly find verses by reference. I haven't figured out all the bells and whistles yet, but so far so good. Excellent Bible app that interfaces with several translations with cross referencing. 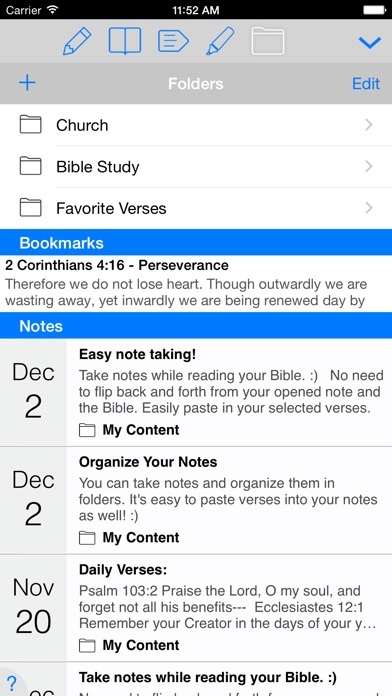 I have used this app for years now taking notes during sermons. Over time I've added translations, study Bibles and reading programs. I can't tell you how many times I've found passages by its search engine. This is among my top apps on both Apple and Android devices. I look forward to having it on desktop! It is my go to every morning. I just wish you offered the daily scripture as an automatic banner every day. Thank you. Gets my day going, grounds me throughout the day and completes the day. Very grateful for this app. This app is very easy to use! I use this app all the time. It is configured well. It's easy to use and to get around the whole Bible. I also received very good and quick support when I had a question regarding a particular feature. I highly recommend this app. This app is amazing. I have the Bible App, Glo Bible, ESV Bible, and others but this is by far the most user friendly and enjoyable. I can copy and paste verses to share via text or social media with ease, not even having to type by hand chapter and verse, automatically this app includes all details for sharing Bible verses. Beyond this defining and checking footnotes is faultlessly easy. As for translation, the NLT is impeccably accurate, close to the Greek in regards to the New Testament. I prefer the NLT, but you can add for an est. 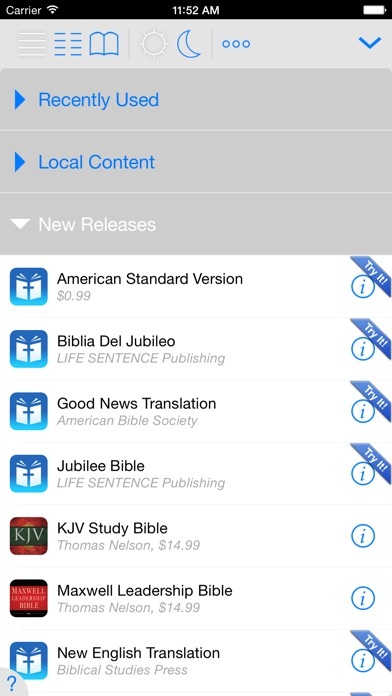 $4-8 additional translations such as KJV, AMPC, The Living Bible, and more. The user interface, style, functionality, and beauty of this app triumphs over all Bible apps. It is worth the money, every penny. This is the Apple version of a Bible if I ever could say so, the user friendliness and aesthetic appeal (artful beauty) makes it feel symbiotic (one) with the iPhone. This app is worthy of containing the words of the Almighty. I love the NLT Bible, it breaks the Word down in a way that allows anyone to understand The Word of God. Easy to read, simple to use. I also purchased other commentaries to go along with this application. The side by side Bible versions also help out when one version is hard to understand. Excellent for the price. Love how the pages flip. 3-Taps to the scripture is much appreciated. App is wonderful. I use it every worship service and for other Christ/faith messages. It has a lot to offer, however I would like to write in margins or highlight parts of a verse. Nonetheless, I am grateful and blessed by your app. Sinner/saved by grace. I only found out recently that the notes I take on when using my KJV bible during church services are automatically synced to my NLT note. That means I can take notes while using any of the versions and would reflect on both seamlessly. This is so convenient and ease of reference. This bible is an easy read for the entire family. It’s also simple to locate the books and chapters.